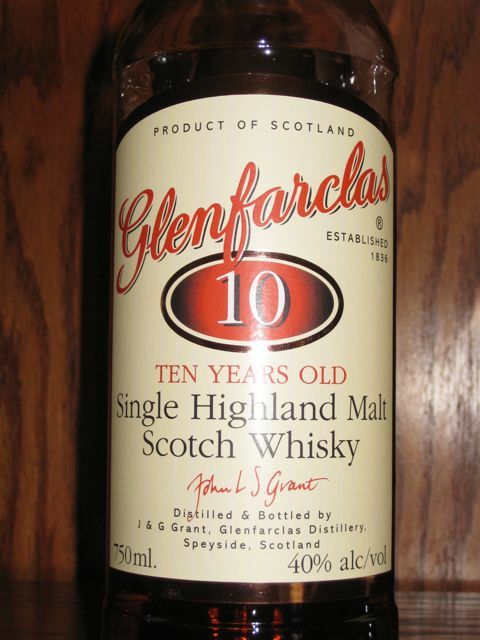 Just in time for your New Year's Eve comparison shopping expedition: a look back at the single malt Scotch whiskys that ended up on my (mostly gardening) Twitter page during the latter half of 2010. The early 2010 reviews can be found here. All of these are of moderate cost. You won't find anything here that costs more than $80. Most are in the $30-$50 range. Three of them are around $20 (Lismore, Finlaggan, Ileach). The term "abv": alcohol by volume. 40% abv, for example, would be 80 proof. Best Buy of the Year: the Lismore 3 pack, available at Trader Joe's (here in the West) for $29.95. These generous-sized samplers (200 ml) run the gamut from mild and tasty (Lismore 40% abv) to "whoosh" (Lismore 50% abv...that's 100 proof!). 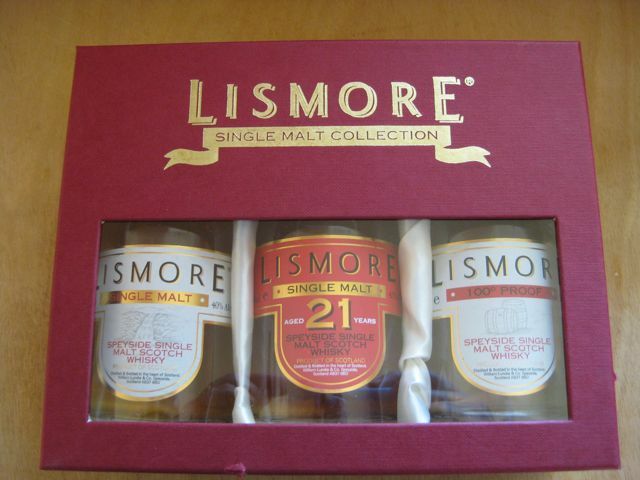 The standout of the three: the Lismore 21 year old (43% abv). If you can find Lismore 21 in a standard sized bottle, it would cost around $150. 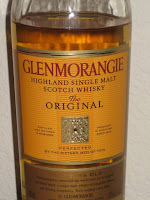 The sherry-honey-toffee aroma is excellent; the menthol-infused taste is smooth without being overpowering. It is warming all the way down. Best Choices for Gift-Giving: the Lismore 40% abv, Bowmore Legend, Macallan 10 Fine Oak, and Glenfarclas 10. To call these middle-of-the-road is unfair. Their smoothness is not a weakness; their aroma and flavor are enjoyed by all. If in doubt, give the Macallan 10 Fine Oak (about $32). 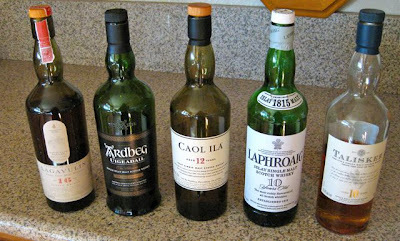 Single Malt Scotch with Balls: The Big 5 of "Peaty, Smoky" include Lagavulin 16, Ardbeg Uigeadail, Laphroaig 10, Caol Ila 12, Talisker 10. This is heady stuff. The aroma alone (especially the Lagavulin) will have folks at the next table wondering what you're drinking. 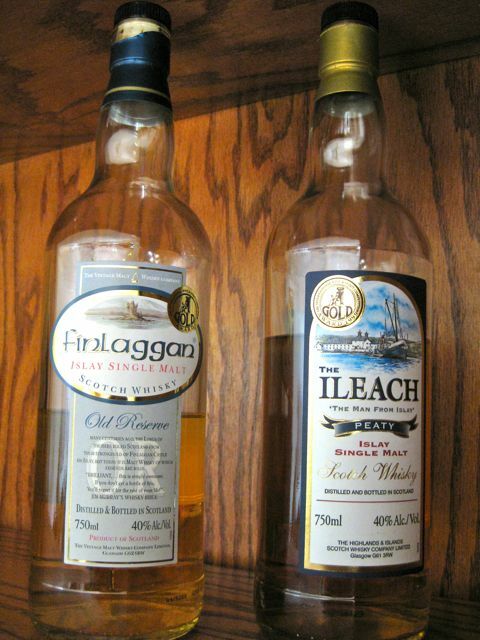 If you are not familiar with the term "Laphroaig headache"...well, you've been warned. 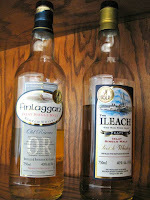 Two inexpensive smoky, peaty selections: Finlaggan and Ileach, which I would swear are the same. Even their labels resemble each other. Don't be afraid of adding water. But no ice. 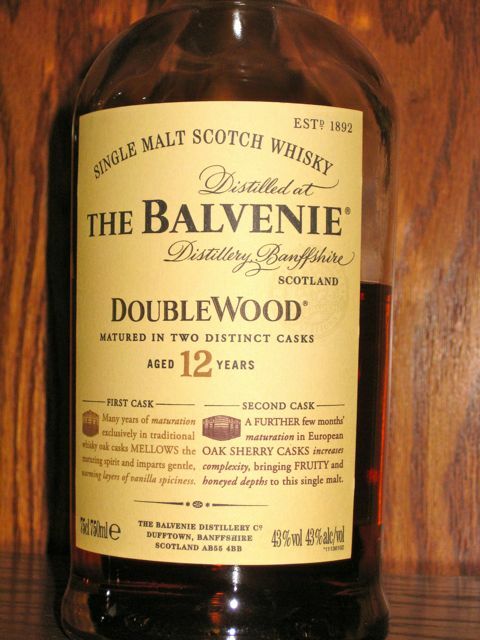 Adding a few drops of water, after sampling a single malt Scotch at full strength, brings out different aromas and flavors. Also, water can help cut the sting when the abv (alcohol by volume) is 43% or greater. Ice will actually bury the aromas and flavors. Add as much water as you like to make it enjoyable, but start off with a few drops. The aroma of a good single malt Scotch can be enjoyed for an hour before the liquid disappears down your throat. OK, a half hour. Well, 15 minutes, anyway. The right glass can enhance the experience. 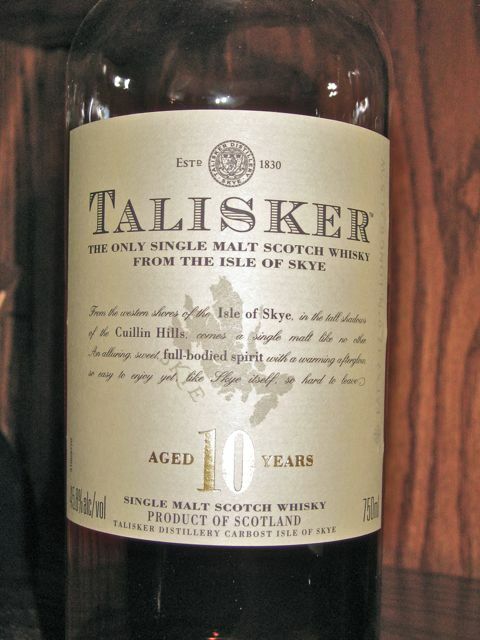 According to Kevin Erskine in his excellent introductory book, "The Instant Expert's Guide to Single Malt Scotch ", the aromas associated with single malt Scotch number more than 60. Or, maybe he didn't say that. It sure seems like it is that many. 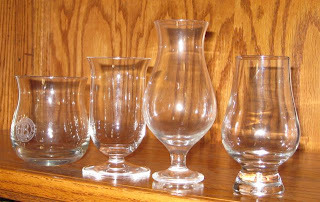 The typical tumbler or "rocks glass" does not enhance the aroma; it can actually detract from the many savorings your nose might pick up. 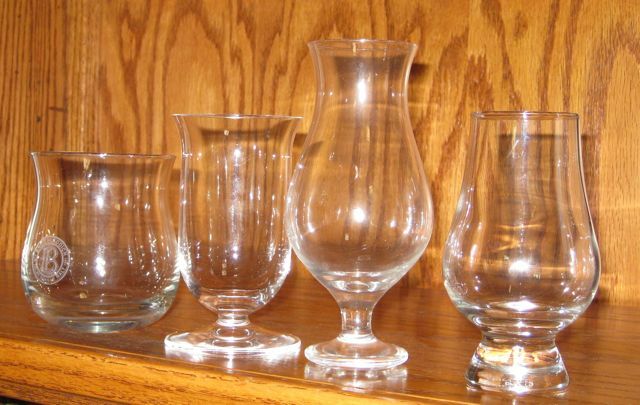 A good glass for sampling single malt Scotch is tulip-shaped: wide at the bottom, narrowing at the neck, and then flairing open at the top. This serves to concentrate the aromas before releasing them. I prefer a wide opening at the top...better to stick my nose in. And if you want to talk knowledgeably about single malts, get Kevin's book. It covers the entire subject very concisely, making you sound like you know what you're talking about, even when you're on glass #4. Lagavulin 16 (43% abv). Perfect blend of smoke/peat for pondering the mysteries of life on a dark night. 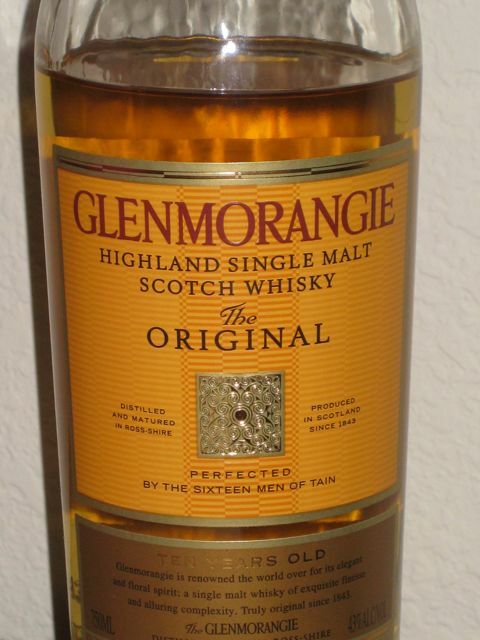 Best treatment for a sore back: a hot tub and a generous pour of 10 yr old Glenmorangie. Your Wednesday is my Sunday. 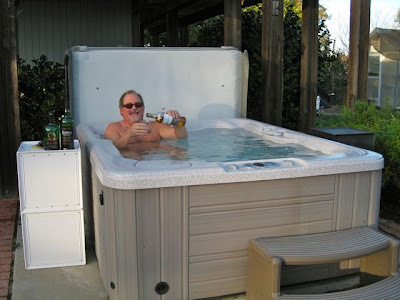 Mmmm, Laphroaig 10 and the hot tub at 8 a.m. Back to work, you slackers! Where does the time go? 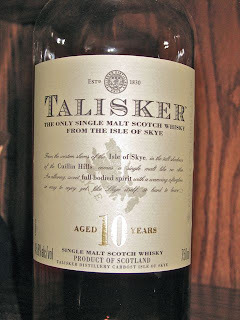 It's already 8:0' Talisker! 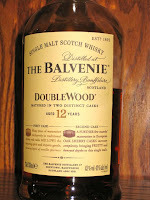 Balvenie 12 Doublewood. They advertise in the Wall Street Journal everyday. But that's no quality indicator. Listerine goes down easier. Lismore 21 (43% abv). Best of the Lismore 3 pack on sale ($30) at Trader Joes. Lismore 21 retails for $150. 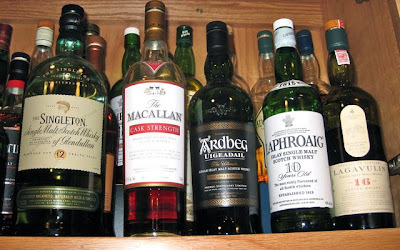 Progress at making more room in Single Malt Scotch cabinet hits a snag. Must buy more Tamdhu 10. A back of the cabinet gem! Stormy, cold weekend ahead. 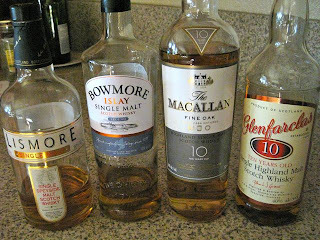 Add compost to garden beds; get frost blankets; stock up on Macallan 10 Fine Oak Scotch. Hey @BevMo : Elk Grove store has no idea what Kolsch style beer is. Never heard of Black Grouse Scotch, either. Trader Joe's does! Glenfarclas 10: Breakfast of Champions...Among those who have declared victory and gone home. Nice! Now that's the way to end the year.